Capturing the light with its sandblasted surface, the Tall Avelino in cinnamon color creates a graceful gesture with its vertical composition. Shown in the photo, a small element of opaque cinnamon colored glass runs up the right side of the piece. This sculptural glass work has been sandblasted creating a translucent effect. 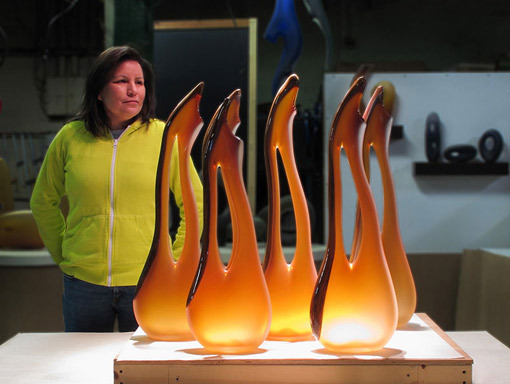 Katie Katz with Tall Avelino glass sculpture group for installation project in Dubai UAE. Read more about Tall Avelino Dubai installation project.